LIUtilities WinBackup (Software Review) - TACKtech Corp. Description: WinBackup makes it easier than ever before to secure your data by making regular backups. Not only will WinBackup help you organize your backups and schedule automatic backups, it will also protect your data using the latest encryption techniques, compress data to save space, create detailed logs of all backup operations and more. WinBackup also features one of the most intuitive user interfaces you have ever seen, making even the most advanced features easily accessible to beginners and professionals alike. Finding a quick and easy back-up program can be difficult. WinBackup is a new tool on the market for backing up to hard drive, CD, or DVD. It's a small program that is very clean and smooth. WinBackup is supported on Windows 95/98/ME/NT/2000/XP. - View the complete list of details. From the main screen you can see the lay out is very clean and easy to get around. The wizard is very different from most programs. It is a nice ideal to allow interactivity. To run some basic tests we backed up 507,360,133 Bytes of regular drivers and miscellaneous files. Here is the details of the system. From the results you may think the file size isn't smaller on WinBackup. True, but I would rather sacrifice size for time, since time is money. 41 seconds vs. 15 minutes for about 30MB. At a retail price of $39.95USD, LIUtilities WinBackup is well worth the money. 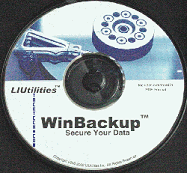 To further entice you LIUtilities is offering WinBackup at the promotional price of $29.95 USD for a limited time. On a side note from LIUtilities, the next version should have tape backup support and a server edition.